Petro oxy cutting systems cuts steel fast, and the thicker the steel, the faster the cut compared to other cutting fuels. Petro oxy cutting systems jumps air gaps and cuts through layers with ease. Also slices smoothly through dirty, painted or rusted steel quickly and without excessive popping. Even cuts concrete-backed steel without exploding the concrete! Petro oxy cutting systems punches clean, straight holes. The Petro oxy cutting systems flame carries the heat all the way down the cut, so holes can be punched fast and deep. This torch pierces 25mm plate like a drill hole, and punches through a 250mm shaft in under a minute without moving the tip. 300mm mild steel shaft in 3 minutes. 100mm manganese steel dipper tooth shank in less than 1 minute. 10-gauge steel at 1300mm per minute. Railroad rail in 40 seconds. 280mm armor plate at 165mm per minute. 250mm thick wall of nuclear service tank at 180mm per minute. Cement coated pipe with a fast clean bevel in a single pass. 25mm mild steel plate at 560mm per minute. Straight hole through 250mm armor plate in 50 seconds. And all these cuts were accomplished without having to pre-heat the steel. The Petro oxy cutting systems flame completely oxidizes the steel and does not weld. Petro oxy cutting systems petrol oxygen cutting models uses petrol as the fuel. It can cut steel under 300mm quickly, such as steel plate/section bar/casting head etc. It replaces industrial gasses such as acetylene or propane. It has an outstanding record for saving energy and cutting costs. 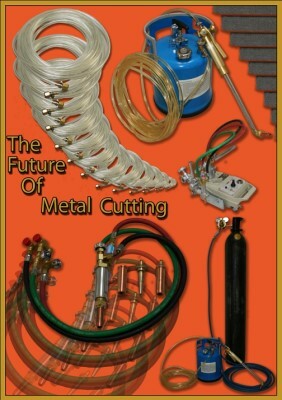 Compared with oxygen-acetylene cuttings, its cost saving effect reaches between 80% to 85%. You can replace 1 bottle of Acetylene with 5-6 litres of Petrol. Keeps cutting while buried in sand, dirt and mud. Elimination of fuel-line back flashes creates operator confidence, resulting in increased productivity.